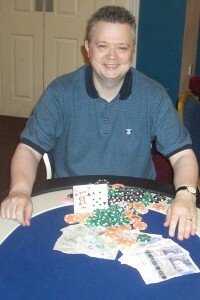 A superb turnout saw a record 39 players create another club record as the prize pool reached £2300 with re-entries. It was also great to see all 4 BCPC players on the Final Table make the money and 3 of them finished 1-2-3. 3rd was Dawn Wilson with Deepstack II winner Tod Wood just failing to win his 2nd Title but that honour went to Andy Duncan along with a nice £505 for his day’s work after the final 5 did a chop.